Purpose: To double the tax on on the retail sale of heating oil, propane, kerosene, and other dyed diesel fuel delivered to a residence or business from $0.02 to $0.04 per gallon, and to impose a gross receipts tax of 1.0 percent on the retail sale of natural gas and 1.5 percent on the retail sale of coal. The estimated $4.6 million tax will be used to increase funding for the state’s low-income weatherizaton program. Analysis: Those voting NO on argued that this was just a “carbon tax” (a tax on fossil fuels for the purpose of lowering Vermont’s carbon footprint), which many had promised not to support while campaigning. Doubling the tax on home heating fuel on all Vermonters is an extreme increase, a regressive tax, and places an undue burden on low income Vermonters and those living on a fixed income. They also noted that the state Weatherization Program already receives significant funding from other sources. Those voting YES argued that the Weatherization Program is critical to fighting climate change. 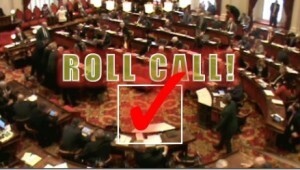 SEE MORE ROLL CALL VOTESNOT SIGNED UP YET? JOIN OUR EMAIL LIST. At some point we will have to break the habit of always increasing taxes on poor and middle income Vermonters, just so the Progressives can grab another political win? I am sad to see we have not reached that point yet? Robin Chestnut Tangerman is our representative. I told him how strongly I felt about more taxes. Especially on fuel. The retired elderly people around me are barely able to pay for heating oil as it is. State says that they have too much money to get any help. I see them struggling, but, obviously, no one in Montpelier cares. Just spend, spend, spend with no accountability. My husband and I are both retired and you want to add more taxes..Heating our home is getting impossible as is it for so many others..all we hear is , Well we will just tax the Vermonters more..when will it end, when we all freeze to death. Plus the guide lines for any help are so low that you have to be on welfare to get any help, and we have way to many young people that are just to lazy to work.. I cannot afford to live in Vermont anymore . My three sons are smarter than I am they moved out along time ago they knew that they were not able to live in the state they were born in all three of them are making a very good living . What are you people thinking you offer $10,000 for people to move to Vermont ,and you can’t even keep your people here . Give me $10,000 to be able to keep my house heated during heating season ten months out of the year. My gosh people we are not all wealthy ..
Save your present full time residents and stop this state price gouging on everything . Previous post: Is Vermont Exporting Maple Syrup and Wealthy Tax Payers?